In our early married years, we had to watch every penny very carefully. Always skimping, checking to be sure all the eggs in a carton were not cracked, buying only necessities and keeping the thermostat at a temperature most people would have found somewhat uncomfortable, organizing errands to make the most of a trip and save fuel, analyzing every purchase, every activity with an eye to reducing as much as possible—and now with my health limiting my ability to work–we’re back to watching pennies. Fortunately, we’ve had lots of practice—and I’ve stockpiled plenty of art materials. Still every now and then it is nice to splurge. My splurge in younger years was a dollar at the grocery store. So this past week I found Chilean bananas. It looks over-ripe but it isn’t. 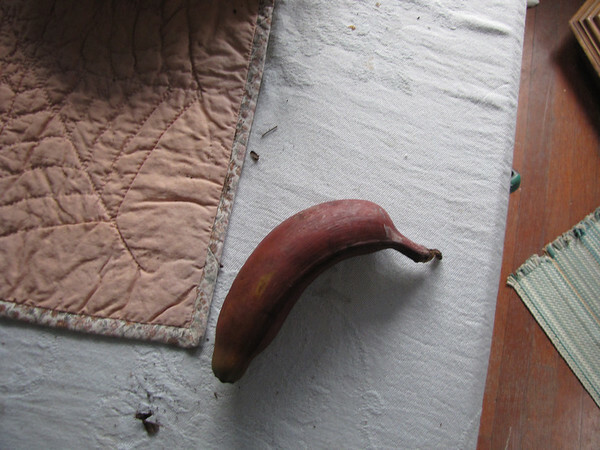 The flesh is a bit darker than usual, the texture more like sugar bananas or finger bananas. 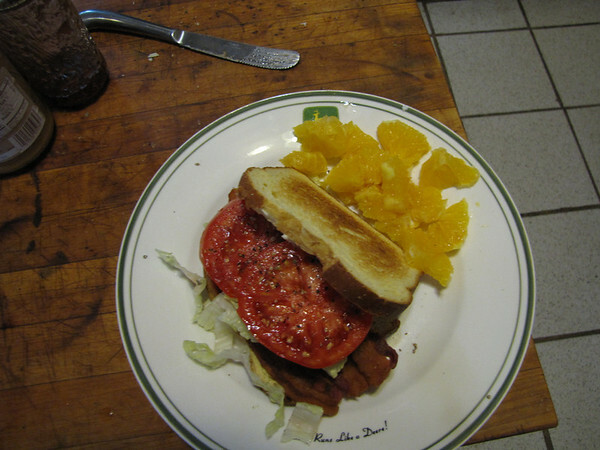 And then I had a BLT made with a tomato picked fresh from my garden. I think the photo is a bit blurry because I was in a hurry to taste it. There’s nothing better than a home-grown tomato still warm from the garden. Your pic of the BLT makes me want to share my good fortune yesterday. My yard guy left 10 ears of corn when he mowed, and a quilt friend brought a large sack of blueberries to me at quilt meeting. Isn’t summer produce wonderful??!! I don’t make jelly or pie–just eat the sweet things fresh until the little seeds give me a tummy ache. Then I freeze them and become more disciplined.